Brought our dreams to life! Enza is simply amazing! We aren't the most creative couple, so we gave her our color schemes and she was able to come up with such beautiful arrangements ideas! We told her random ideas and she made them come to life. She did all that and came in under our original floral budget by working with us and even volunteered to eliminate things that she thought were unnecessary with the venue we had. Her crew was already at the venue setting up when we showed up 5 hours before the wedding and stayed there helping to break down the decorations when the event ended. Lastly she helped us to make donations of the flowers to a local hospital after the event so our flowers could bring smiles to others like they did for us. Enza is a gem and made the whole process a breeze. If ever we need floral/design help, Enza will be our go to designer! The absolute best event designer! I truly cannot say enough amazing things about Enza and how talented her and her team are. They were an absolute dream to work with throughout our entire wedding planning process and on our wedding day. Our December wedding was at the Loading Dock in Stamford, CT, which is a very industrial venue and a true blank slate. We knew our decor needed to be spectacular to transform the space into the chic winter wonderland vision we had in mind. Enza knew exactly how to guide us, while giving us space for our own ideas to be creative. I knew I was in great hands from our very first phone call when she walked me through her ideas for the space. She is a true professional and is extremely responsive, accommodating of changes (I changed my mind constantly and she never made me feel like I bothered her! ), and is the sweetest person ever. Our wedding was absolutely stunning because of her (it poured all day and I didn’t even notice because I was so in love with the decor inside!) If you are looking for an amazing event designer in the CT/NY area, I would highly recommend Enza and her team. We are so grateful for everything she did for us! Olivia!!!!!! Thank you SO much ...that was so sweet. I still look at your photos and continue to love everything. You guys were amazing to work with & I am so happy that we met your expectations. We could not thank Enza enough for all of her beautiful work, we received so many compliments on all of the arrangements from the centerpieces, to the fireplace mantels and beyond. The bridal party bouquet's were the MOST beautiful arrangements I have ever seen and far exceeded my expectations. All of Enza's hard work and creativity helped us to have an even more beautiful wedding than we could have imagined. It was our pleasure to work with Enza and so appreciate all of your work. Enza was so flexible, accommodating and easy to communicate with throughout the process and we knew immediately after meeting her that she would be the perfect choice! We would be so happy to recommend Enza & Enza Events to anyone looking for vendors in the future. Enza completely saw my vision and made it come to life on my wedding day. I STILL get compliments on my flowers - even from people who just saw on social media! Look no further - Enza is the real deal. My husband and I got married on June 29th, 2018 and chose Enza Events as our florist. From the beginning Enza was kind, professional, and beyond knowledgable. She answered all of my questions, detailed emails, and made every interaction with her and her team simply wonderful. Our flowers were beautiful for our wedding. She made she that all the colors and flowers I wanted were represented in each bouquet and arrangement. Our centerpieces added the perfect touch to tie in the theme and colors of our wedding. My guests have personally contacted me to tell me how beautiful all the florals were at our wedding. I chose two different centerpieces for the reception. Enza helped my vision come to life with votives, candles, lanterns, and bud vases (my favorite). I would like to say thank you to Enza for the incredible experience you gave me during the wedding planning process. I would highly recommended Enza for your wedding or special event. She will not only be the most genuine and kind vendor you work with, she will ensure your floral vision comes to life beyond your wildest dreams. Sorry for the late response ! Being able to work with you on your wedding day was so special ...thank you for letting us be a part of it. Enza is the absolute BEST florist!!!! She truly made our wedding a work of art. Enza designed the beautiful flowers for my sister's wedding, so I knew they would be fabulous - but she truly blew us away!!! From our consultation meeting, Enza was a true professional, who wanted to understand and fulfill my vision. She was easy to communicate with, and kept visual references in the proposal so I knew we were all on the same page. She also had thoughtful and creative suggestions. The trial was stunning and her assistant, Chris, is a pleasure to work with. Our chuppah, centerpieces, bouquets and cocktail flowers were just gorgeous and so much more beautiful than I could have described/envisioned. We got so many compliments, and the centerpieces looked gorgeous the next day when we put them out at brunch (the arrangements lasted for days!) She added flowers to our wedding cake and made our venue come alive with candles. Enza even texted me the bridal and bridesmaids bouquets the day before, and personally came to oversee all of the flowers. I really can't say enough about the care and artistry you receive when working with Enza Events! Still one of my most favorite weddings! Thank you for being so amazing to work with. Wishing you and your beautiful family all my best. I cannot say enough about Enza. She got it from day one. My daughter Cait was so happy withE Enza Her work is impeccable. Her vision is on target she understands what her client wants and she delivers Her staff is very helpful. She delivered beyond expectation for my daughter Cait's wedding. It was a pleasure to work with her! Sally!!!!! Miss you :) Thank you for the kind review. Caits wedding was spectacular and you were a dream to work with. I loved working with Enza! She was amazing to work with, listened to the look we wanted and executed it flawlessly. The bouquets, flower centerpieces and cascading flower backdrop were all amazing. I would highly recommend - thank you again, Enza!! We had an outdoor tented wedding in June and Enza created an incredibly beautiful event for us. Guests could not stop raving about how beautiful it was. She had creative vision and brought enthusiasm and expertise to the job. Most importantly, Enza was an excellent listener and went out of her way to make sure that I was happy with the flowers and decor, and worked closely with me to bring my vision and my taste to the wedding. She worked flexibly with our budget and she was a pleasure to work with. We had our wedding in May 2017 at The Loading Dock in Stamford, CT, and Enza handled our flowers, lighting and décor! Our wedding looked more beautiful that I could have ever envisioned. Enza is extremely personable - you feel like you are talking to an old friend each time you talk to her about your event. She is a great listener and makes sure to ask questions and make suggestions to address every last detail, all the while being respectful of the budget. I provided one “inspiration” photo of a flower array as a basis for my color scheme and Enza took it and ran, surpassing my expectations. The Loading Dock is an amazing venue but I was a bit nervous about decorating the “blank canvas” of a space. Enza transformed the space and it took my breath away when I first saw it. We loved working with her and her team and will recommend them to anyone planning a big event! Enza was absolutely fabulous to work with! I got married in July 2015 and I could not have been more impressed with the final product that she designed for me and my groom. She and her team handled all the florals, decor and lighting for my special day and they could not have been more perfect. One of the best things about Enza is that she really listened to what I had to say and made sure she stuck with my vision. Her knowledge of the industry allowed her to understand what I wanted and gave great feedback and suggestions on how to make it all happen. She had great ideas and was really hands on throughout the entire planning process. The final product was above and beyond what I could have imagined. I would recommend Enza Events to anyone who is planning a wedding or big event! Enza was an absolute pleasure to work with! When I had my initial consultation with her she immediately understood my vision and offered great suggestions to help bring it all to life. 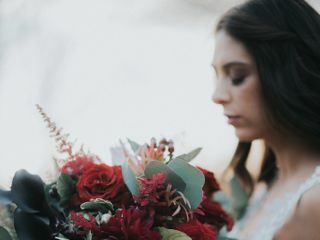 Wedding planning can be overwhelming with all of the details, but Enza really made this process fun and uncomplicated. She was always very responsive to my emails and was hands on throughout the process. 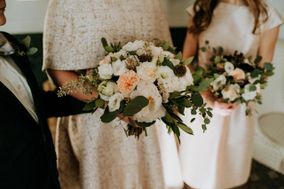 Enza and her team handled all of the floral decor as well as the linens, and I was literally swooning when I saw it all put together on my wedding day. My guests were floored by the decor as well! It was worth every penny and then some - there was not one thing that disappointed. You hear horror stories out there about irresponsible vendors, but with Enza you get the utmost professionalism and worry free planning, not to mention the gorgeous decor. It is so obvious by her designs how much she really cares about the quality of her work, and also about her clients to put so much thought and effort into creating the most beautiful event. I would recommend Enza to anyone out there - you will not be disappointed! When my husband and I decided upon a wedding venue, we were given two options for florists. Though the initial florist we chose was professional, friendly and made beautiful arrangements, I just felt like something was missing from what I had envisioned. We decided to meet with Enza and felt immediately that she understood what kind of look we were going for. Despite my numerous phone calls about specific details, she never seemed frustrated with me, and always made time to speak with me so that we were on the same page. At the very last minute, I asked her if she could put together a simple and elegant design for our wedding cake, as well as a manzanita wishing tree in lieu of a guest book. I was floored at how gorgeous everything turned out. People still compliment me on the decor of our wedding five years later! Enza was the consummate professional and made us feel that she cared about making such an important day in our lives absolutely perfect. Working with Enza was beyond a pleasure. Within the first few minutes of our initial meeting with her she completely understood our vision and what we were looking to accomplish through the decor at our wedding. She was beyond responsive with every question I sent her way, and provided both impeccable service and the highest quality of decor for our New Year's Eve wedding.